THE SKINNY: This is the first time I've been less than impressed with a product from fresh. This light serum went on cool and refreshing and felt good on my skin. But it didn't do anything close to creating a matte finish, and within a few hours, my T-zone was oily. According to fresh, umbrian clay "works to neutralize acidity, purifying and clarifying the complexion." That wasn't quite the experience I had with it. A product that claims to help create a matte finish shouldn't leave my face feeling oily. CHECK IT OUT: Want a second opinion? 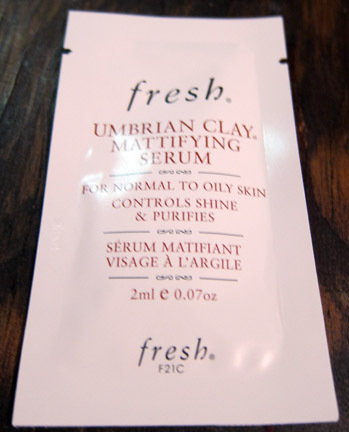 Umbrian Clay Mattifying Serum does get good reviews on its website.